Amazon is currently offering iOttie iON 10W Qi Wireless Charging Stand in three colorwares for $34.92 shipped. That’s good for a 24% discount from the going rate, is the first notable price drop we’ve tracked and a new Amazon all-time low. Comprised of a soft feathered fabric, this model features a more premium design than your average wireless charging pad. Plus, not only does it support 10W charging speeds, but also 7.5Q. That means iPhones can take advantage of fast charging as well. Rated 4.6/5 stars from over 170 shoppers. If you’re looking for a less premium way to wirelessly power your phone, we spotted Anker’s PowerPort Wireless Qi Charging Pad for $14. There are also plenty of other more affordable options at Amazon, like CHOETECH’s 5W charging pad. More smartphone accessories: iPhone XR Tempered Glass Screen protector 2-pack: $2 (Reg. $10) | Amazon w/ code D4ZTCPOB Anker’s Amazon sale includes the SpaceView Baby Monitor, more RAVPower Quick Charge 3.0 10000mAh Portable Charger: $18 (Reg. $30) | Amazon w/ on-page coupon + code EI222GGO Insignia Car Mount: $10 (Reg. $15) | Best Buy Have Alexa or Assistant control your lights with two TP-Link In-Wall Switches for $60 (33% off) Aukey 20000mAh USB-C Power Bank: $32 (Reg. $40) | Amazon w/ code Z3LXZX3V CHOETECH 19W Solar Phone Charger: $46 (Reg. $60) | Amazon w/ code R5XLBR7T Add Alexa control to your garage door with Chamberlain’s $50 MyQ Hub at a new low ($30 off) Deals still live from yesterday: Anker 3FT MFi USB-C to Lighting Cable: $14 (Reg. $16) | Amazon w/ code ANKERCTL RAVPower 60W 6-Port USB Charger: $20 (Reg. $25.50) | Amazon w/ on-page coupon + code PC029W60 Eve’s new HomeKit-enabled Energy Strip gets first price drop to $90 shipped for Earth Day GOOLOO 24W Two-Port USB Car Charger: $7 (Reg. $11) | Amazon w/ code PH7NE74F The iON Wireless fast charger stand integrates the power of Qi wireless fast charging technology with an angled design ideal for viewing content at home or in the office. The wireless fast charger for Samsung or iPhone allows you to charge conveniently without cords by simply resting the device against the anti-slip pad. The design of the wireless phone charger features two Qi coils allow for wireless charging in portrait or landscape mode. The iON Wireless Qi charger Stand is designed with a 65 degree tilt that allows for viewing content or notifications while charging wirelessly at home or in the office. Today, popular accessory manufacturer iOttie has unveiled its new iTap 2 wireless car mount series. 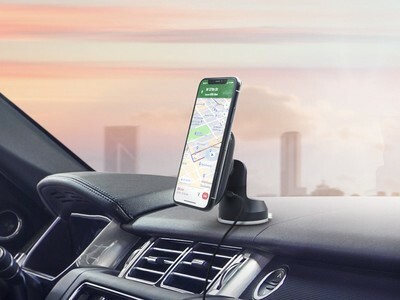 Alongside continuing its reign as arguably the best smartphone mounts on the market today, iOttie is bringing Qi charging to the mix on each of today’s new items. Like its well-established line of products, there will be three different iterations of the iTap 2 for your car’s dashboard, air vent and CD slot. With Qi charging hitting the mainstream over the last year on Android and iPhones across the entire lineup, more consumers are interested in charging on-the-go. Head below for a look at the new iOttie iTap 2 lineup. iOttie iTap 2 Wireless Dashboard Mount If you’re familiar with iOttie’s lineup of dashboard mounts, then the iTap 2 will feel right at home. It sports the brand’s usual reusable suction cup mount system with a lever lock to keep things in place. Plug it in with the included microUSB cable and car charger, and you’ll be ready to charge your device via the built-in Qi coils right away. Interestingly enough, instead of going with a case, iOttie will be including a protective film system for your device with integrated magnets. This solves the age-old problem of trying to keep your device in place with vertical mounts. Previously we’ve seen bundled cases, stick-ons, and a range of products to solve this issue. The iOttie iTap 2 Wireless Dashboard Mount is available for pre-order today at $54.95. Air Vent Mount iOttie applies many of the same design principles to its new iTap 2 Air Vent Mount. It’s largely identical to the dashboard mount both in price and practice. However, it obviously attaches to a vent, something that some consumers have complained about for years. Often warm or cool air coming out of said vents can cause issues for devices, often overheating. It’s something to be aware of, but if you’re already sacrificing a vent for this mount then chances are you don’t mind. The iOttie iTap 2 Wireless Air Vent Mount is available for pre-order today at $54.95. CD Slot Mount Interestingly enough, we recently shared an iOttie CD slot mount deal and I was somewhat surprised by the replies on twitter. Many users noted that CD slots aren’t a necessity in vehicles anymore. While it’s true — my car doesn’t haven’t one — there are still plenty of vehicles out there on the road where an unused CD slot mount can be turned into something more useful. Personally, I find that far more practical than the air vent mount. It will of course offer the same Qi charging like the rest of today’s new products. The iOttie iTap 2 Wireless CD Slot Mount is available for pre-order today at $54.95. You can save an extra 15% off all products at iOttie currently when promo code iOttie15 is applied during checkout.